Coming into today, the story of the game was how both teams like to dominate the line of scrimmage and play a physical style of football. In the first half, both defenses did just that only allowing a total of 10 points scored between them. After one half of play, Cal gave up 193 yards of total of offense. 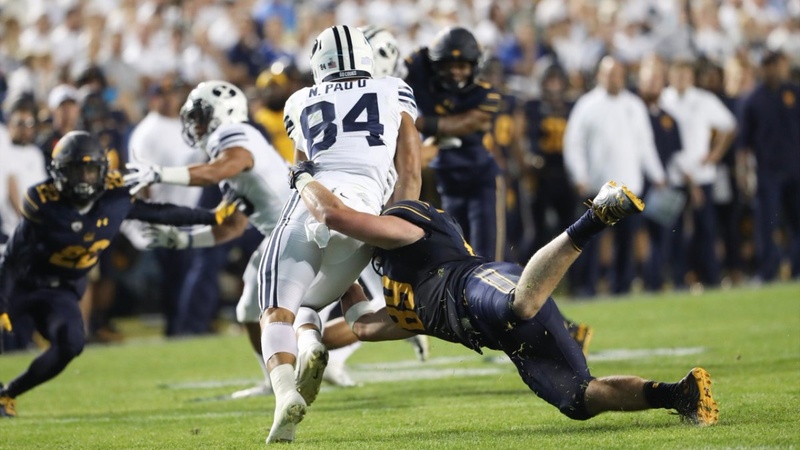 Evan Weaver and Jordan Kunaszyk stood out combining for 16 solo tackles helping the Golden Bears bend-but-don’t-break defense to hold the Cougars to only three points. On the offensive side, Cal’s only scoring drive of the half came on a 25-yard touchdown pass from Garbers to running back Patrick Laird. The Bears had a total of 124 yards on offense with 72 rushing yards and 52 passing and dominated the time of possession 19:42 compared to 10:18 from BYU. In the second half, the Bears just like making things close giving up a late touchdown with 51 seconds left in the game which gave everyone a flashback to last weekend, almost giving up a 24-3 lead. Luckily, Cal was able to recover the onside kick and run out the clock for the 21-18 win, and they're second on the season. California showed how good their defense indeed is today giving up one touchdown (the other on a fumble return) and forcing three crucial turnovers down the stretch.Sure tackles, hard hits, and suffocating defense were on full display for the second straight week which helped cover up a couple of pimples on the offensive side. Those pimples include a fumble return to the house, a muffed punt, and an interception from Chase Garbers. Baldwin’s offense looked a lot smoother this week because of how well Garbers and Mcllwain were able to make plays with their legs. The Bears offense finished with a total of 398 total yards, doing a much better job of having a good mix of run and pass plays.